Beekeeping is a long forgotten activity that is not only fulfilling but also rewarding if implemented correctly. But how do you keep bees in the backyard your kids use frequently? How do you ensure safety? And above all, how do you get started? 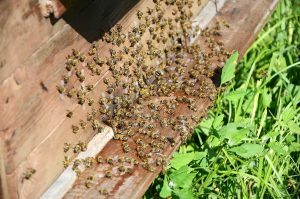 These are just some of the questions that need to be answered before you can start an organic backyard hive. Remember that a swarm of bees can be deadly. Always take your time, be gentle and avoid provoking the bees with things like perfumes or loud noises around the hives. Always wear protective gloves and a veil. Bees purchased through mail-order can be unhealthy because they are mass produced and exposed to harsh chemicals during the production. These types of purchases can also lead to receiving bees with a queen who does not know her workers, making it hard for the bees to work together and form a beneficial colony. If possible purchase your bees from local organic beekeepers. Bees feed on honey to grow and gain strength. So, if you want to be a long-term bee farmer, do not harvest honey within the first two years. Allow the bees to enjoy the honey without distraction, and they will grow in numbers and become stronger. Start harvesting minimally during the third year leaving enough honey for the bees to feed on especially during cold winter months. Always remember that you are practicing organic bee farming. Whether your bees are attacked by wax moths or mites, there is no room for chemical pesticides. Starting with a large colony from the beginning will help reduce some of these problems. Beekeeping can be a rewarding venture, especially to nature enthusiasts. But, to get things right, seek advice from a local organic beekeeper who understands how bees behave and survive during different environmental and climatic conditions within your area. Background information for this article was provided by MCGBioMarkers.com. © 2019 Garden & Greenhouse and NUGL Media Group. All rights reserved.